Our lives are filled with clutter. News. TV. Ads. Email. Twitter. Facebook. While all are great, they contribute to the clutter that we see. Standing out and earning and holding someone’s attention is getting harder and harder. This goes for both personal and marketing communication. We’ve all been there – tuning out our significant other because the game was on or something shiny was on the side of the road. Our constant need to multitask has overcome the human decency of paying attention to the people we’re around. On the business end, we all see it. Email marketing open rates are dipping and on a site like Twitter only 25 percent of your followers will see what you Tweet out. So on both sides of the coin, Main Street and Wall Street are losing. While that last line is a bit ironic, the challenge that companies and individuals face each day is real – clutter kills. Cutting through it takes more than a Ginsu Knife, it takes caring. From a personal end it’s putting the phone down, turning off the TV and looking at the person you are talking to, devoting all of your attention to them. Hell you expect folks to pay attention to you, the least you can do is pay attention to them. On the business end it is getting personal and knowing your customers. Yes I know your demographics say one thing about your customers, but are you really listening? Take a look at your email inbox or the ads on the right-hand side of your Facebook page. How many of the ads are relevant to you? I’m sure you look at, click or open the message that is tailored to you instead of the one talking about underwear. Clutter is an enemy that we have to beat. Cutting through the noise is something that we need to do to win at our personal and professional lives. jeffespo Well, I do have some poems that talk about knives. 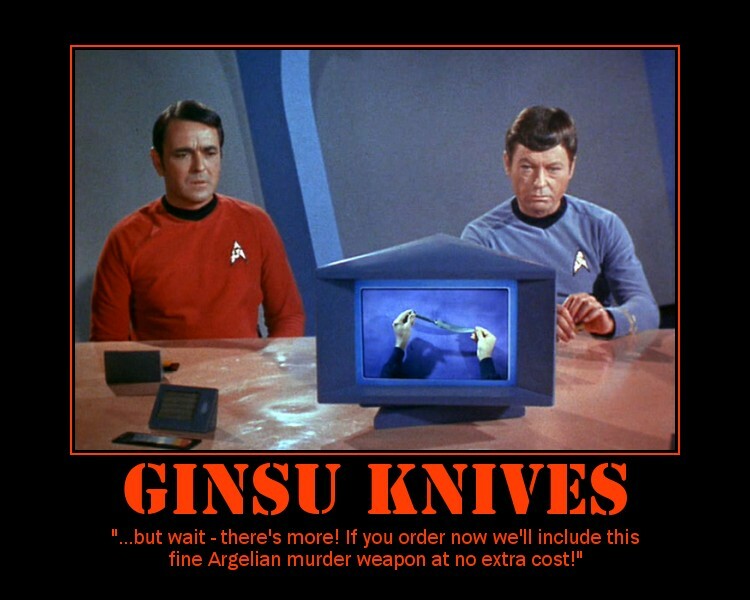 I don’t know if they’re Ginsu ones. ErinMFeldman should I be scared? jeffespo Not at all. I haven’t had any knife training in years. I used to train in Japanese jujitsu, and we sometimes worked with knives.